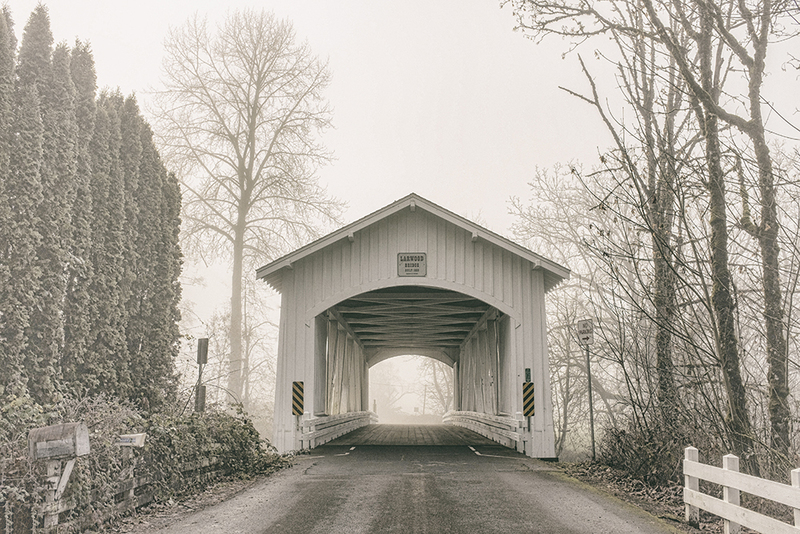 Rugged pioneers armed with only hand tools, sweat and ambition began building covered bridges in Oregon during the mid-1850's. They often camped out at remote sites, living off the land or contracting with local farmers for food. Early covered bridge owners often financed construction by charging tolls: 3 cents for a sheep, 5 cents for a horse and rider. In the early 20th century, the state provided standard bridge designs to each county, most of these structures incorporated the Howe truss. The abundance of Douglas Fir and the shortage of steel during the world wars continued construction of covered spans well into the 1950's. A wooden bridge was covered to keep the huge truss timbers dry. 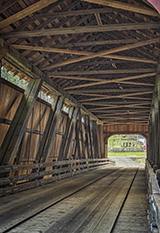 A covered bridge could last 80 years or more, while an uncovered span would deteriorate in about nine years. In Oregon, legislation was established in 1987 to help fund preservation of these rich links to our past and heritage. Larwood Covered Bridge with a special edit. One of a series taken on a cold winter morning by Paul Deatherage.